Each and every child could do their best on the Physical Festival. We regret that the date and place was changed but we thank you for cheering on your child. Thank you to all the parents and PTA members who helped make the day great. A week after the Physical Festival was the senior group presentation where the seniors showed their jump rope, stilts and unicycle skills to the Intermediates. The seniors received warm applause on the Physical Festival day and could learn the importance of practicing. There were also some comments from the intermediates like “I want to try the unicycle” and “I want to get better at jump rope”. Unicycling, stilts and Jump rope are key components of building an able body. This leads to such results as building muscle mass, improving hand co-ordination, improving jaw muscles, making stronger teeth and a sense of balance. Educationally it has a great effect on children and it can foster this talent. This knowledge strives to foster ability within all children. As children are born with an innate curiosity which is motivation. However, for this motivation to succeed it must be nurtured in the correct environment. For this motivation to not be lost it has to have a decisive person behind it. We encourage children to be motivated and look forward. In this society it is important to be competitive and encourage children to find what they are interested in. 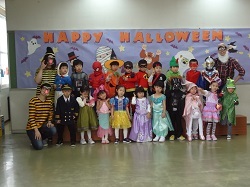 The Kindergarten is preparing for the Hyogen Festival in November. We hope to foster each child’s motivation and completeness so they can grow and develop in a different way to the physical festival.